This edited collection offers a range of the current theoretical concepts and perspectives that shape international social development today. Utilizing examples from actual social workers in regions such as Asia, Eastern Europe and Latin America, International Social Development brings together scholars who are engaged internationally in social development work aimed at addressing poverty, gender inequality, sustainable livelihoods and food security. The first of its kind in Canada, International Social Development will assist students in building critical knowledge, learning methods to mitigate post-colonial attitudes and developing practical skills essential to doing social work in an increasingly interconnected and globalized world. With greater populations across the globe becoming increasingly vulnerable to the effects of poverty, environmental degradation, globalization and urbanization, the need for social work professionals to adopt practices that address such complex social issues is dire. With this need in mind, the early chapters of the book conceptualize and discuss the general objectives and various models of international social development, with particular attention paid to Canadian aid organizations and the concept of gender in international social research and practice. 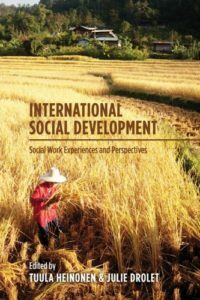 Subsequent chapters highlight specific international social work projects from around the globe, dealing with discriminatory practices in tsunami-affected South India, food security in Brazil and gender equality in rural China, making this book a well-rounded introduction for students unfamiliar with international social development and a primer on pressing issues for social work professionals already working in the field.